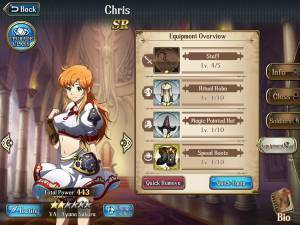 The stats of your heroes can be increased by equipping the gears (equipment), this includes armour, helmet, and the accessory. Obtaining gears can be done by playing Time Rift mode and the Chapters in story mode, Achievement, gifts, and chests. Although you can get gears via summoning it is recommended that you do not spend Trinity vouchers for this purpose as you can easily obtain high-quality gears from the ways mentioned. Making the gears you get stronger can be done three ways. The first is to increase its level by using strengthening material which can be obtained through Time Rift mode or from the Chapters in story mode. This is done using the 'Forge' option to fuse the gears with duplicates, or with special items to enhance the item level. The second is to increase the level cap of the gears using rune and the same name gear (runes can be obtained from Time Rift mode). And finally using the Enchant scrolls where enchanting will grant random stats to that gear.